The Doctor, Jamie and Zoe stumble across Hy-brasil, the vanishing island of Irish legend. There they find the Fomori, a supernatural race whom Irish heroes were supposed to have fought in the legendary past. Not that Jamie believes a word of it. “And I’m Manannan mac Lir!” interjected Jamie. For once, Jamie knows more about their hosts than the Doctor and Zoe: he’s well-versed in Celtic mythology. He knows how dangerous it is to trust the Fair Folk— if that’s what these beings are— and he knows something about Balor One-eye and his daughter. But of course, legends are very garbled versions of the truth. It turns out that Hy-Brasil isn’t quite the paradise island of myth. And as we all know from Irish folklore, if you spend time with the fae, you may go missing for a very, very long time indeed. This audio is a clever SF remix of various elements of Irish mythology (tiptoeing around the fact that Jamie is Scottish, but then, there’s a lot of shared cultural heritage). Each of the TARDIS trio has an opportunity to use their particular skills. Narrator Stephen Critchlow, as usual, handles everyone’s voices well enough to capture their characters. 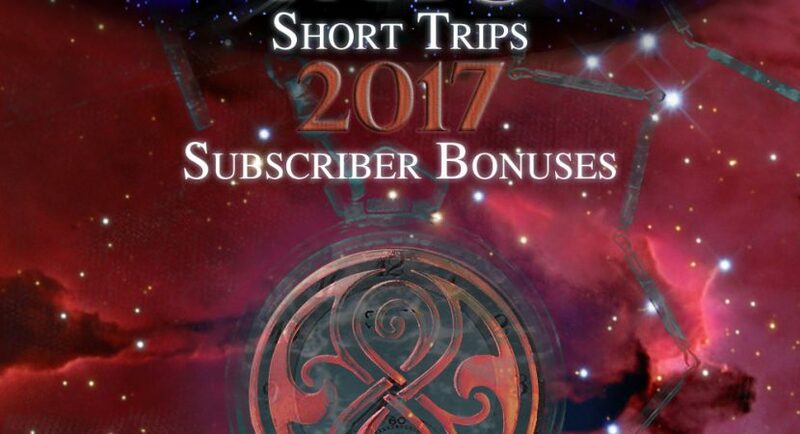 At 42 minutes, this Subscriber Short Trip is creeping towards Companion Chronicles rather than Short Trips length. Subscribers get more? It comes bundled with a subscription that includes Main Range #226, Shadow Planet / World Apart.